The riad is about a 15 minute walk from the famous square Djama Lafna, the Marrakech museum and from the old school Medersa Ban Youssef as well. It is also about a 15-minute walk from the new city Geliz. Menara Airport is about 2 km from the hotel. The hustle and bustle of the medina is quickly forgotten when entering the riad as calm reigns in the contemporary decor. It has six bedrooms, a TV lounge, dining room, a patio featuring walls of running water bringing freshness and a sunny terrace. The design hotel was recently completed. Guests are welcomed into a lobby with 24-hour reception and check-out service. Facilities include air conditioning, a hotel safe, WLAN Internet access, room and laundry services, and a car park. Guests can wine and dine in the café, bar and restaurant. The rooms are stylishly appointed, featuring a large double bed, air conditioning, Internet access. Each also comes with a private en suite bathroom . Younger guests can enjoy a dip in the children's swimming area. There are also sun loungers with parasols laid out ready for use. Furthermore, massages and spa treatments are also available. Featured amenities include limo/town car service, dry cleaning/laundry services, and a 24-hour front desk. A train station pick-up service is provided at no charge, and self parking (subject to charges) is available onsite. 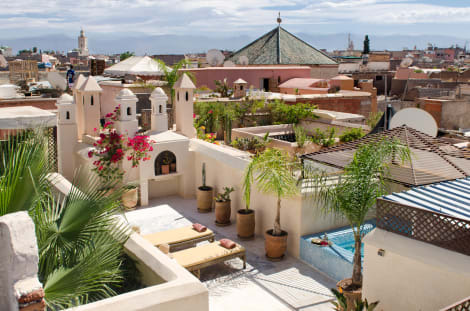 Enjoy gorgeous views of the Atlas mountains from the rooftop terrace and hot tub of the 3-star Riad Vert, a short walk from the souks and Jemaa el Fna in the medina of Marrakesh. Decorated in a traditional Moroccan style, the seven air-conditioned rooms have wi-fi access, en suite bathrooms, complimentary toiletries and a hairdryer. On arrival, you’ll be greeted with a complimentary fresh mint tea in a classic example of the friendly culture. Take in the views from a terrace and make use of amenities such as complimentary wireless Internet access and concierge services. Additional features at this riad include babysitting/childcare (surcharge) and a television in a common area.